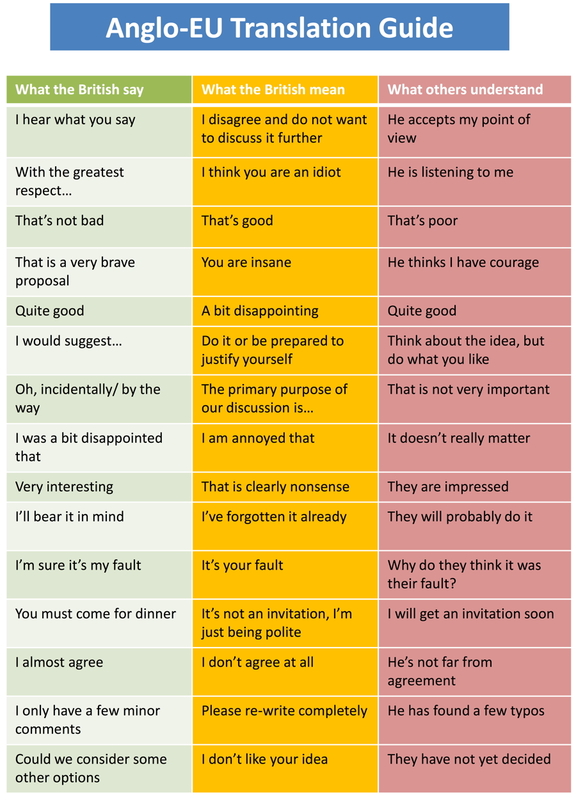 The problem with these guides is that they always focus on what people say when they don’t like something or someone. (The “That’s not bad” rubric is a counter-example, but then it’s hard to tell the difference from “quite good”). But surely even Brits do have nice things to say about some things from time to time. So what do they say when they actually like something? For example, what would a Brit say if he actually wants to admit it’s his fault? If the someone sometimes makes understatements and sometimes says the reverse of what they really mean, then some things are impossible to communicate. If people always said the opposiite, saying “it’s entirely your fault” means “it’s all my fault”. If it is an undersatement, it means “I think the situation is your fault to the extent that I am actually willing to say this”. I guess the latter interpretation is correct in this example. So, I can’t think of a way to convey “it is my fault entirely” in a sincere manner in British.